Based in Scotland, we are specialists in constructing historically-accurate and well-made British Napoleonic headdress completely bespoke to your requirements. You’ll find examples of our work elsewhere in this website but if you are looking for a Belgic cap, Stovepipe shako, Cocked Hat or Bicorne then look no further. Though we carry a small selection of hats permanently in stock, it’s best to contact us directly with your request and queries because we tailor each hat to the customer – from the construction materials right down to the interior lining. We can also supply the correct plumes for your chosen hat together with shako plates, cockades and cords. 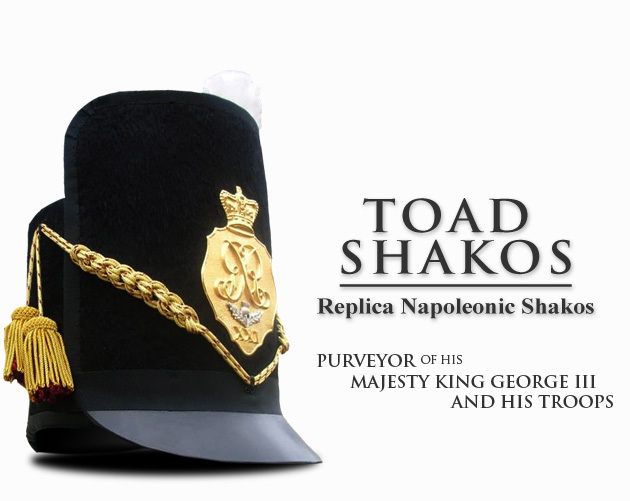 Enjoy your visit to Toad Shakos and we hope to be your premier destination for Napoleonic headdress! TOAD SHAKOS make and supply outstanding replica Napoleonic Shakos! For questions or enquiries, please fill in our contactform below.